Can you let me in please? It was a game like no other. 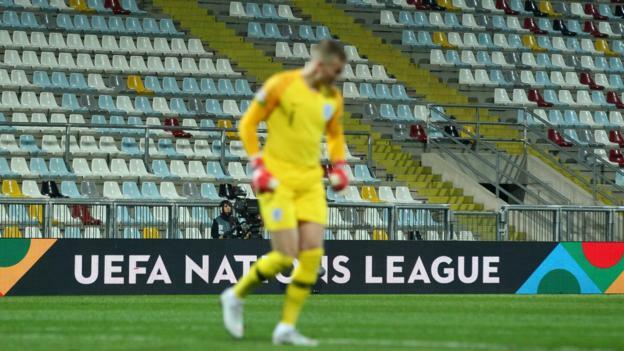 England faced Croatia in Rijeka behind closed doors, with the goalless draw described as “weird” and “strange” by the players. At times, events bordered on farcical. We look at some of the particularly unique elements of a game played in front of an official attendance of zero – and hear from those inside and outside the ground. A programme – but who’s buying it? Football memorabilia is big business online – and this programme will certainly be a collectors’ item. The Croatian FA pressed ahead with publishing a guide to the match, well aware there would be no fans around the ground to actually buy it. The person who announces the line-ups before kick-off usually does it to rouse the crowd, but who was the guy in Rijeka trying to gee up? The noise when the players entered the pitch in Rijeka was deafening, but only because the music on the speaker system was cranked up so loud. With the players lined up and just the band playing, you could clearly hear members of each team belting out their respective songs. England full-back Ben Chilwell, making his full England debut, told Sky Sports: “It was strange, when you step out and sing the national anthem in an empty stadium. While the official attendance was marked down as zero, there were still some fans who managed to get a sneak peak of the game. Some in a nearby block of flats got a good view if they were high up, while England supporters found a vantage point on a hill. At one point, they were heard singing, “Pickford, Pickford give us a wave” – and there were loud cheers when the goalkeeper obliged. Although manager Gareth Southgate played it cool afterwards by saying he was concentrating on the game, midfielder Eric Dier said with a grin that they could “easily” be heard as “they were the only ones here”. Stewards had to take care of whole stands by themselves. Mind you, it’s not difficult when all the seats are empty. At one point in the game, it got so quiet that you could hear the beeping as a truck reversed, as well as the clicking of a photographer taking pictures. BBC Sport’s Sam Bryant spent the day with England fans in Rijeka. The dedication some England fans show is remarkable – 1,048 miles for a game Uefa had said no fans would be allowed into. But there was a determination to enjoy the day, and at least try for a glimpse of the pitch. After an afternoon enjoying the sunny city centre, attentions turned to getting nearer the ground. Stadion HNK Rijeka was about four miles from the harbour and by early evening, a handful of Three Lions supporters were gathering in a nearby bar. Two hours before kick-off, time to explore the nearby hills. Forty-five minutes of winding roads later and a few distant glimpses of the pitch was all that could be managed. Requests to locals to watch from their balconies proved fruitless for the supporters I was with. Into a second hour of walking, fans managed to get to the back of one of the stands, but police stopped anyone going any further. 1,048 miles, minus 10 metres. Back to the bar it was. In the glimmer of the floodlights, but restricted to a TV screen like the fans back home. At half-time, rejuvenated, a second attempt. This time, a smattering of fans were in luck. One road led to a rocky hill behind one of the goals and from there, half the pitch was visible. This would most certainly do. Local police were there and welcomed England fans to watch. The mood was jovial and at the end of the match, fans were guided back to the local taxis. Despite the scoreline, it is these sort of trips that make the miles worth it for these England fans. Seeing your friends, watching your country, having fun. Handshakes all round, onwards to Spain. BBC Sport’s chief football writer Phil McNulty was one of a lucky few allowed in to the stadium. This was an occasion that, in a sporting context, held an almost morbid fascination. Croatia playing England should be a major event and yet the drive out to the hills outside Rijeka saw no traffic, no supporters and a passport check at security to ensure no fans were masquerading as members of the media. The whole evening was shrouded in an unreality that made even reporting on it an occasionally bizarre experience. Sometimes a look up from a laptop is prompted by a roar from the crowd – this time it was as a result of a raised voice on the pitch or an increase in volume levels from the players. There were interesting notes to be made, such as how much quieter Croatia’s players were than England’s and how Jordan Henderson is the loudest voice in Gareth Southgate’s team. There was even the sound of laughter from one culprit in the sparse crowd when Marcus Rashford offered up a miserably tame attempt to put England in front. Moments of quality – and they were very rare – were greeted with polite applause rather than roars of approval as pretty much everyone inside the stadium was part of the media operation or were dignitaries, sponsors or stewards. There was Raheem Sterling picking up a booking for carrying on and playing the ball once play had stopped – he could hardly use not hearing the referee’s whistle as an excuse. It was an occasion that perhaps got the match it deserved and the final whistle was blown to a backdrop of silence. If there was any consolation for those fans who would have liked to be inside this stadium in Rijeka, it is that they did not miss much.